Successfully Added HK Warehouse Doogee Mix Android Phone - Android 7.0, Dual-IMEI, 4G, Octa-Core, 6GB RAM, 5.5-Inch Small Bezel Display (Blue) to your Shopping Cart. The Doogee Mix Android phone is one of China’s latest bezel less smartphones. With its gorgeous 5.5-Inch edge-to-edge display, this stunning smartphone is guaranteed to treat you to breathtaking visuals. The latest Samsung super AMOLED technology lets you enjoy vivid color and high details while watching your favorite media. By supporting HD resolutions, you’ll truly be treated to a cinematic experience anytime you turn on this Android phone. It treats you to 64GB internal storage and a 128GB SD card slot. This means that you’ll have all the space needed to store and carry along your films, games, and other media. Underneath its display, this Android phone packs the Helio P25 processor. As an Octa-Core CPU that has been clocked at 1.69GHz, this piece of equipment brings forth a powerful performance. Along with its 6GB of RAM, this cell phone lets you tackle the most demanding software without dropping a frame. It furthermore runs on Android 7.0. This means that you’ll be able to smoothly run the latest Apps without encountering any lag. With its 3380mAh battery, you can use all your phone has to offer for up to 8 hours in a row. This latest Android phone comes with Dual-SIM card slots and two IMEI numbers. Additionally, it supports 4G. Thanks to this, you can be guaranteed that you’ll always stay connected. Whether you’re at home, at work, or traveling abroad – with the Doogee Mix smartphone you’ll always stay within reach. It furthermore comes with a stunning 16mp Dual-Rear camera that features a Samsung ISOCELL sensor. With this piece of equipment, you’ll be able to snap mesmerizing photographs and Ultra-HD 4K video of all your upcoming day trips and holidays. 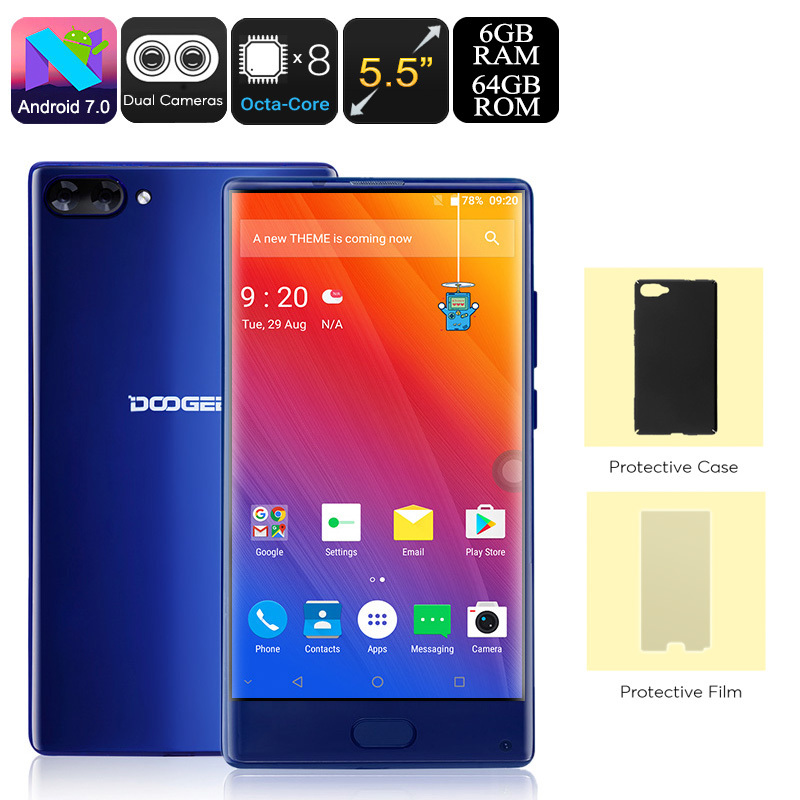 The Doogee Mix Android phone comes with a 12 months warranty, brought to you by the leader in electronic devices as well as wholesale smartphones..